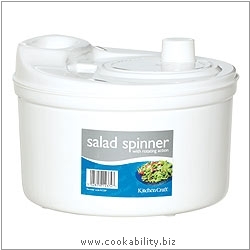 A rotating action salad spinner with enclosed base to prevent drips. Load the internal basket with lettuce, replace the lid and rotate the knob on the lid to spin the lettuce. The gearing ensures quick efficient results with the minimum of effort.